Click Annual MI Yard Sale here or in the left sidebar to go to the web page for details. You probably thought that typing "www.marrowstone.info/yardsale" into your browser would have brought you directly to the yard sale web page. Below is an explanation for why it brought you here and asked you to "Click Annual MI Yard Sale here or in the left sidebar to go to the web page for details." First, the full primary URL name for this website is https://sites.google.com/site/marrowstoneislandinformation/ . That is too long and not easy to remember. That is why I purchased the URL "www.marrowstone.info" and had it set up to point to and invoke https://sites.google.com/site/marrowstoneislandinformation/ . Second, https://sites.google.com/site/miemergencyprep/ is the primary URL for the MI Emergency Preparedness website . It's name is also too long and hard to remember. But since I consider it (and other websites I will be developing) to be subordinate to the Marrowstone Island Information portal I decided not to purchase a shorter and simpler URL. Third, since the URL ( https://sites.google.com/site/miemergencyprep/home/annual-yard-sale ) for the "MI Yard Sale" is also too long and hard to remember, I chose to provide this link-page to make it easier to click and go to that page. Thus, typing "www.marrowstone.info/yardsale" into your browser, or clicking on that link in the "footer" of all Island Net email postings will bring you to this web page and all you need to do is follow the above instruction "Click Annual MI Yard Sale here or in the left sidebar to go to the web page for details." 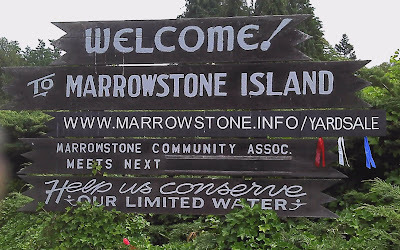 Note in the photo below that I have temporarily added "/yardsale" to the "Welcome to Marrowstone Island" sign in the triangle coming onto Marrowstone Island so that it reads "www.marrowstone.info/yardsale". I will remove it immediately after the yard sale.